have a Massively Transformative Purpose (or mission) to which they latch on with laser-sharp focus. It could be a quirky idea, or a truly forward looking and disruptive break through innovation. have an exponential mindset and seek to deliver at a minimum, a 10x improvement over their peers or status quo, which helps them to choose the problem space, and not the problem or solution itself. 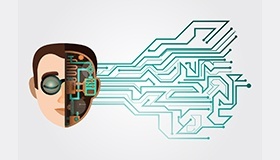 In many industries AI (Artificial Intelligence) and ML (Machine Learning), which were once considered as futuristic technologies, are becoming as ubiquitous as UI (user interface). Augmented and Virtual reality (AR, VR) are already being used for creating virtual and/or augmented user experiences in diverse domains ranging from fashion to real-estate. A host of exponential technologies including data science, digital biologyand biotech, medicine, nanotech, digital fabrication, networks, computing systems, robotics,and robocars are rapidly accelerating and shaping major industries and all aspects of our lives. Successful Unicorns or ExOs have demonstrated that there is a new way of doing business, that uses a combination of culture, technology, needs, and incentives to deliver innovative digital solutions at lightning speed. 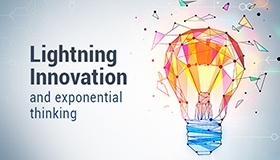 HBR calls this approach as Lightning Innovation, which doesn’t involve huge technology risks, targets established domains and markets, delivers immediate returns with innovations that outperform established way of doing things. As ISVs (software business) matured over the past few decades, they have also acquired many characteristics that are often associated with old economy businesses. Very often successful software businesses are organized in a hierarchical structure, with linear processes, and focus on meeting immediate or prioritized (and narrow) customer needs, which forces them to think and act incrementally.